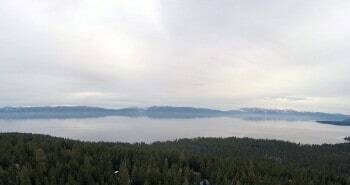 Over the last 2 weeks we have had some storms come though here in Tahoe but its been to warm and today it finally started to snow pretty good at least at altitudes higher than 6500 feet. I got up early and went to a cafe in Tahoe City this morning and it was pouring rain, after a few hours I decided to go home and finish off my work day and to my surprise at the cabin it was snowing! Now, I gotta head down this crazy hill to go watch the new snowboard movie from Jeremy Jones Higher!